Everyone loves taco night, right? Depending on where you live, a lot of great things have been happening with tacos over the last several years. Specialty tacos with locally sourced, organically grown ingredients are making their way onto trendy menus all over the place. Like many formerly humble dishes, the foodies have taken the taco and made it something truly special, and I think that movement should make its way into our kitchens, as well. I’m not saying there’s anything wrong with tossing a little ground beef into a pan with some taco seasoning and enjoying it, but I am saying it doesn’t take much to elevate taco night in your own kitchen to something just a little more special. It doesn’t have to be crispy pork belly tacos with a homemade red cabbage slaw in garlic lime aioli. (Yes, that’s a thing. Yes, I’ve had it. Yes, it’s awesome.) However, these ground chicken tacos with roasted poblanos are a nice step up from the standard packet of powder dumped into the pan. The point of this post is to highlight a few techniques that will dramatically elevate your homemade tacos that require a minimal amount of effort, time and skill. Additionally, this is a recipe where I use a pre-made seasoning sauce. 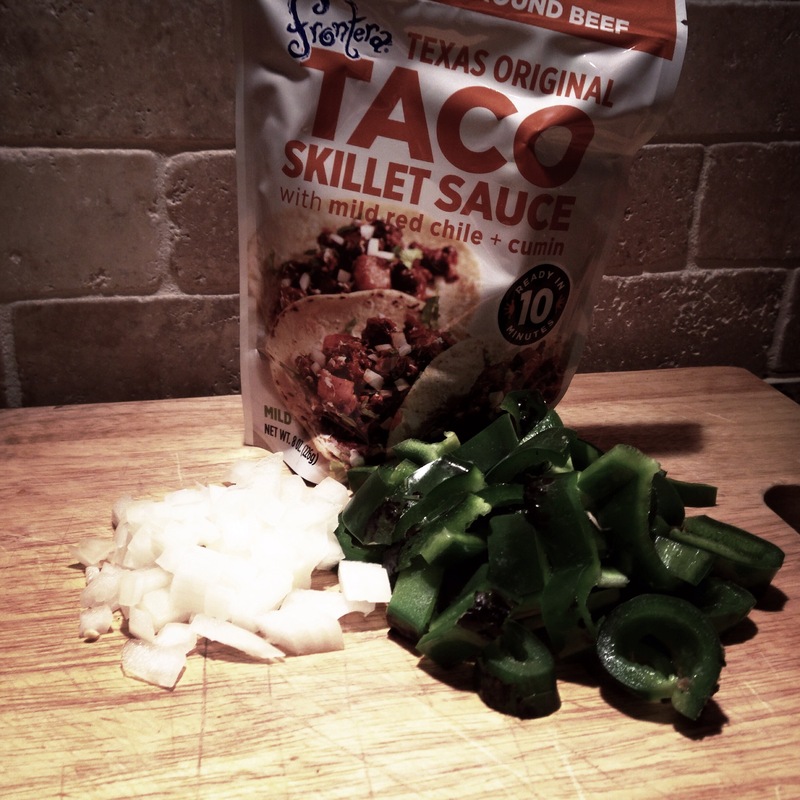 I use a Rick Bayless taco skillet sauce, which will make you forget that taco seasoning packets were ever a thing, and it’s a great time saver. For a future taco night post, I will definitely go into making a seasoning blend from scratch, but these skillet sauces are delicious and a great place to start upping the game for homemade tacos. So, let’s make some tacos! The longest part of this meal will likely be preparing the rice, so get started on that first. I typically choose a boxed Spanish rice that is made with water and one can of tomatoes. The tomatoes help keep the moisture in and make the rice a little more forgiving when it comes to cooking time. Once the rice is going, we’re going to quickly char the poblanos. Not only do the charred peppers add a ton of depth to the flavor of your tacos, but charring them on the stove is pretty fun. 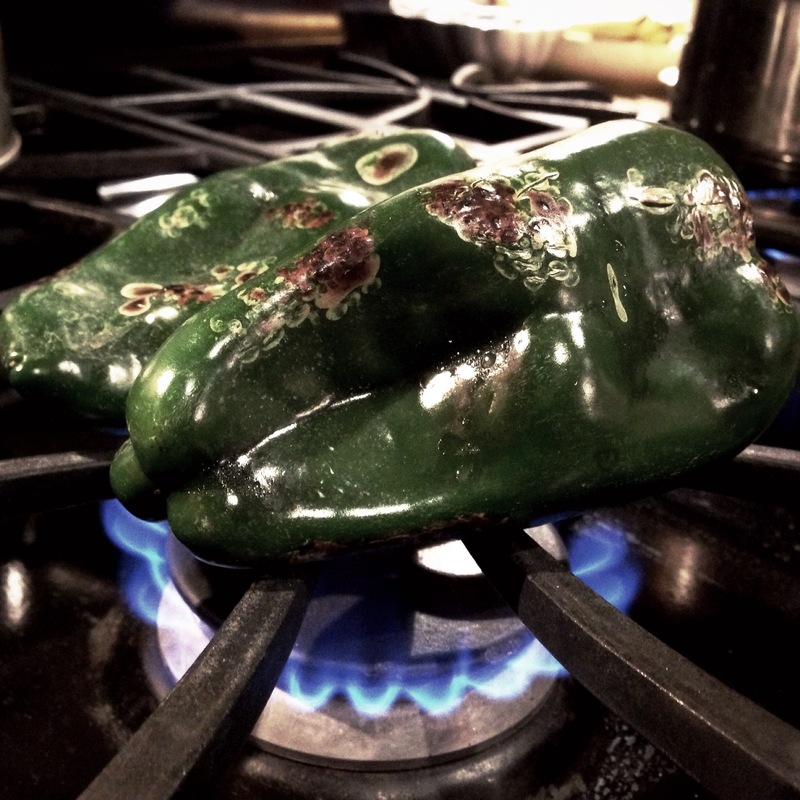 Turn your burner on medium-high and lay the washed poblanos right on the burner. Turn them occasionally with tongs. You’re not trying to blacken the whole pepper or light it on fire or anything, just let it get charred and blistered a bit as in the picture below. Slice the peppers, and set aside along with a small amount (maybe 1/4 ) of the finely chopped onion. The peppers and the uncooked onion will be used to top the tacos later. In a heavy pan, heat some olive oil and start to brown the the chicken along with the remaining 3/4 of the onion. 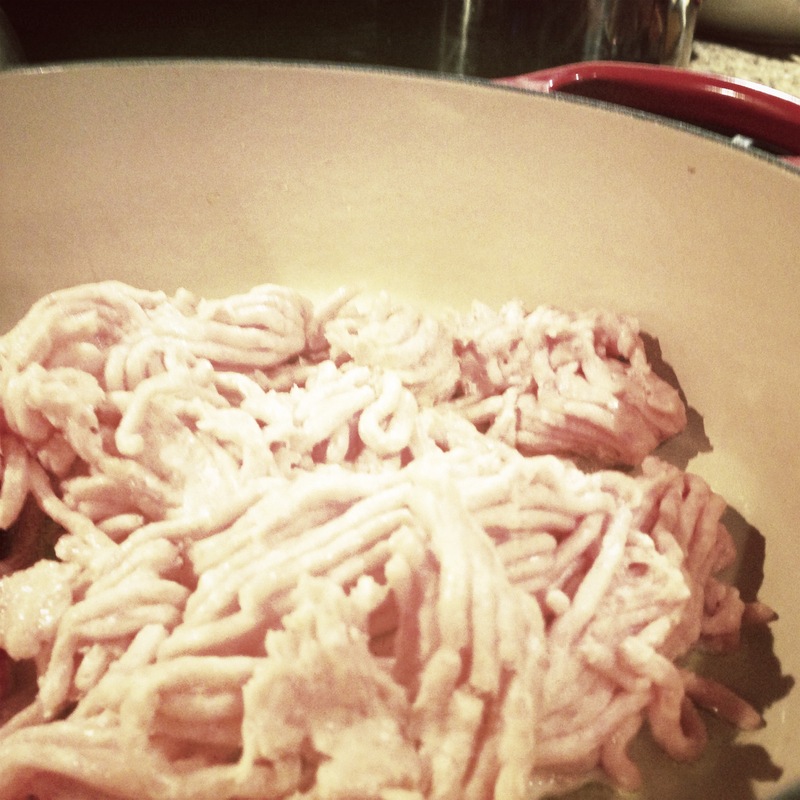 After a few minutes, add the minced garlic. When the meat is starting to brown, but not quite cooked, I like to cover the pan to keep everything juicier while it continues to cook. Once the chicken is cooked through, stir in the skillet sauce, turn the heat to low, and simmer for at least 10 minutes (up to 30 if you need the time). 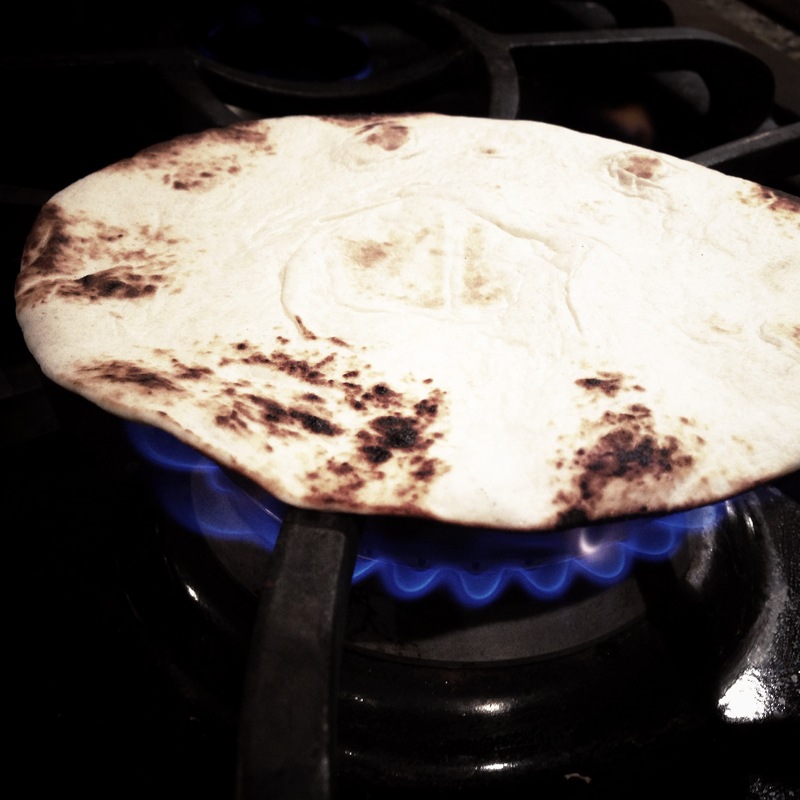 Toasting the tortillas is simple. Just like with the poblanos, have your tongs ready and toss them directly onto the stove over a medium or medium-high flame. They will only take about 4-5 seconds per side at most. Whenever we have taco night, we always make a few quesadillas to go along with the tacos. The little guy loves them, we love them…honestly, everyone loves melted cheese. 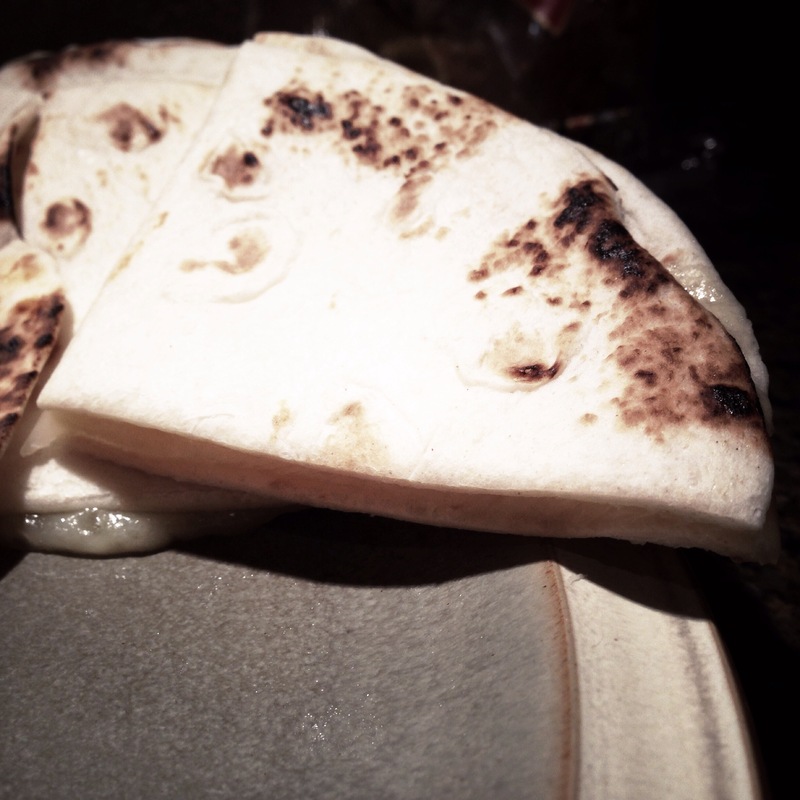 The charred tortillas are the secret to making quick quesadillas that taste restaurant quality. Restaurants make quesadillas in pans, which is why the tortillas get crispy and delicious, as opposed to the the soggy mess that occurs in the microwave when making quesadillas. However, that’s another pan to deal with and more work while trying to get a meal together quickly. So, my solution is to use the charred tortillas and then make the quesadilla in the microwave while the rest of the meal is cooking. Take two of the charred tortillas. Lay one on a microwaveable plate. Cover with shredded cheese, and you will want to use more cheese than you think you need so that you get a nice, thick, gooey layer of cheese when you’re done. Place the other tortilla on top and microwave on high for about 30-35 seconds. As soon as you take it out, flip the quesadilla over and gently press the center down to help melt any stubborn cheese that didn’t get the message. Let it cool for a minute, and then slice into triangles. The perfect appetizer or side for taco night, ready in just a few seconds. Cool. Welcome back. 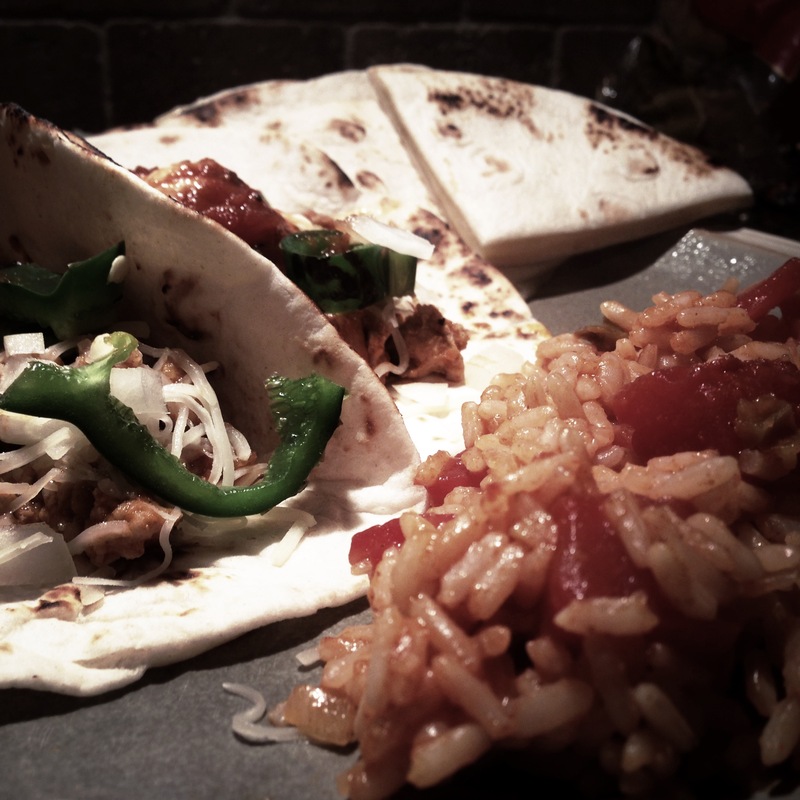 By now, your rice should be done, your taco meat should be fully simmered, and your tortillas are ready to be filled. 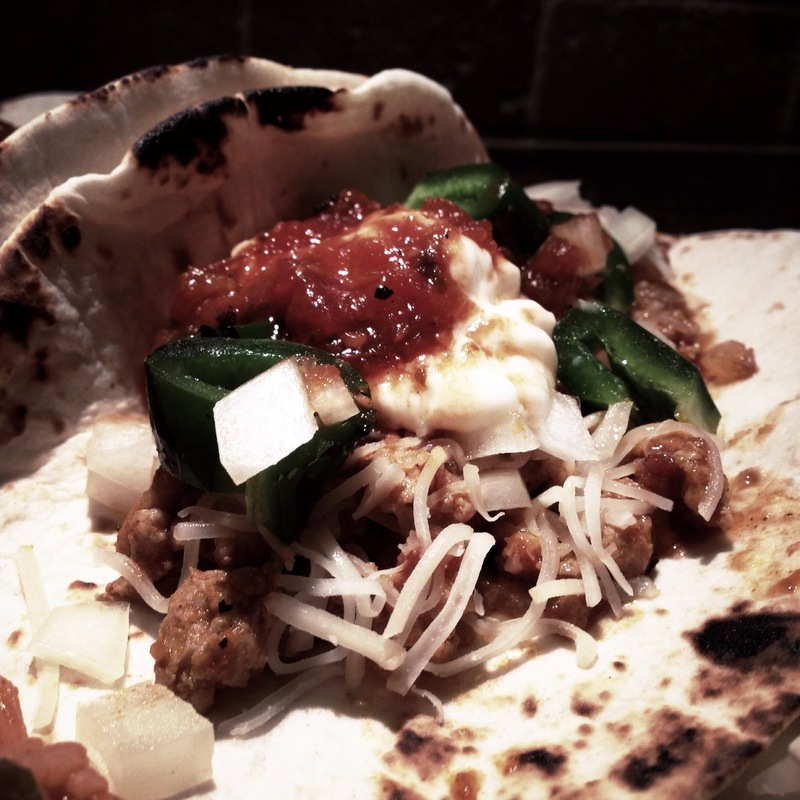 It’s time to start constructing your tacos. First spoon a little of the meat into the tortilla. Sprinkle some of the shredded cheese onto the warm meat so that it melts. Next cover with some of the charred poblano and raw onion. (Note: Poblanos are not typically a spicy pepper, but they can be. If little eaters are involved, or anyone who doesn’t care for spicy peppers, be sure to taste a piece before serving to avoid any unhappy eaters.) Add a dollop of sour cream and a little salsa, and you’re all set. 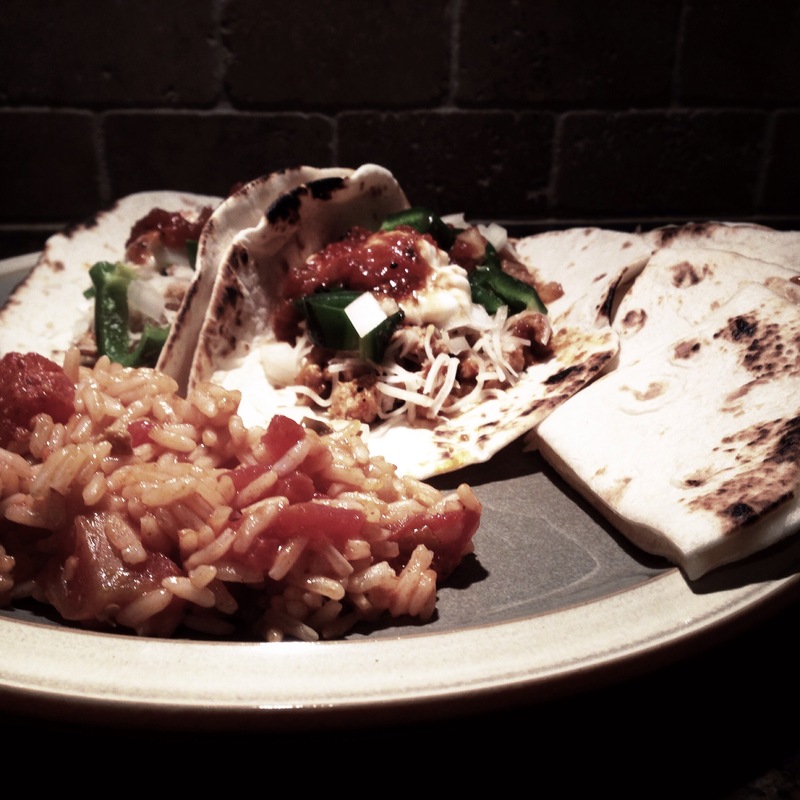 Spoon some of the rice onto a plate along with a few quesadilla triangles, add the tacos, and you’ve got a nice little taco night dinner that will taste immensely better than any taco seasoning packet could have provided. Sure, the skillet sauce was a short cut, and I probably could have made my own salsa from scratch, but this is a meal that can be made on a busy weeknight and still taste impressive. Charring the peppers and the tortillas are easy ways to elevate your tacos, and this is only the beginning. Maybe next time I’ll head to the butcher and whip up some of those crispy pork belly tacos… For now, Enjoy!